Grandpappy Point is a full service marina serving it’s customers year ’round. We are the only marina on Lake Texoma with a 35 ton marine travel lift with mast step crane. 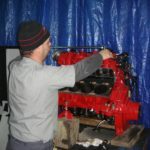 At Grandpappy Point Marina the service department is constantly seeking new and improved ways to better serve our customers. Exceeding customer expectations has been our primary goal of the department for decades. We hope that when your service needs arise, you will look no further than our service department to get you back on the water. In effort to provide the best possible service, we are continually purchasing equipment and making technological advances to better serve our customers. Last year we purchased the Mercruiser CDS computer diagnostic system. This system allows our technicians to quickly and accurately detect intermittent conditions. The CDS allows manipulation of wiring harnesses or components with the engine not operating, while observing the computer readout. The CDS can also be connected and observed while operating the vessel. For our customers with Volvo engines, we purchased the Volvo diagnostic tool. Volvo has developed the user-friendly and highly portable Volvo Diagnosis Application (VODIA) in order to facilitate repair and maintenance operations for our Volvo service technicians. The handheld computer has a touch screen for maximized usability, and relies on Windows-based software for troubleshooting, parameter programming and test operations. VODIA has contributed to increased efficiency at our repair shop – and reduced downtime for our customers. In addition to engine diagnostic equipment, the service department purchased a corrosion test meter from Professional Mariner. This meter is used to determine the corrosion potential of the underwater metals on your boat and tells if your boat is protected from stray current or not. Most of the time, corrosion is not detected in a timely manner and there is no evidence until the boat comes out of the water for service. Corrosion repairs are extremely expensive especially on outdrives that stay in the water all of the time. Also, our marina technicians will be using this tool to spot check docks to get an early warning that there is excessive current in the water. As always, we continue to offer the same excellent services we have had in the past. Mechanical service, such as winterizations, oil changes, tune ups, outdrive service, and air conditioning and heating repair, are just a few of the things we offer. Yard service, such as bottom jobs, gelcoat, compounding, waxing, and painting round out the routine work we do on a weekly basis. All of our personnel are factory trained in their respective fields and attend extensive training throughout the year as technology advances and product updates take place. The Grandpappy Parts Dept. offers marine parts and accessories for both powerboats and sailboats. Our Parts Dept. is equipped for gasonline & diesel engines such as Mercruiser, Mercury, Crusader, Volvo Penta, Chrysler, OMC, Yanmar, Universal, Westerbeke and Fisher Panda. Grandpappy also offers gasoline and diesel generator parts for Kohler, Onan, Westerbeke, and Fisher Panda. Also available in our parts dept. 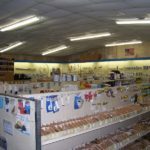 are electrical supplies, lubricants, marine cleaning supplies, paints, varnishes, head parts, safety equipment, bilge pumps, and much more. Also, don’t miss out on our sailing gear and equipment like Harken, Schaefer, Davis, Edson and a full stock of nylon and braided lines. Call Today to schedule or discuss your service needs.